Pending a physical, Tigers slugger Miguel Cabrera will reportedly sign an eight-year contract extension worth $248 million. Given the two years left on his current deal, and two reported vesting options in the extension, Cabrera could make $352 million over the next 12 seasons. This is, to use a technical term, bananas. Between this deal and Clayton Kershaw's, the new bar for superstars has clearly been set at $30 million a year. It took a surprisingly long time to get here: the first $10M AAV deal was given out in 1996 (Albert Belle), the first $15M in 1998 (Kevin Brown), and the first $25M in 2000 (Alex Rodriguez). Knowing baseball (and barring an apocalyptic labor battle in 2016, which is seeming more like a distinct possibility), there is no going back. And when Mike Trout signs his first long-term deal in the next few seasons, it's going to be even more eye-popping. Miguel Cabrera is a wonderful baseball player. There is nothing he can't hit. He won the Triple Crown in 2012, then had an even better season in 2013. Given that the market has set the price for one WAR at $6 million, Cabrera—a seven-win player over the last three years—is actually a bargain at $30 million. But thinking short-term on a long-term contract is dangerous. Even without the vesting options, this deal will run through Cabrera's age-41 season, and every piece of evidence pre- and post-PED era should be setting off alarm bells. No one, not even a player as durable as Cabrera, can be the same hitter at age 40 as at age 30. 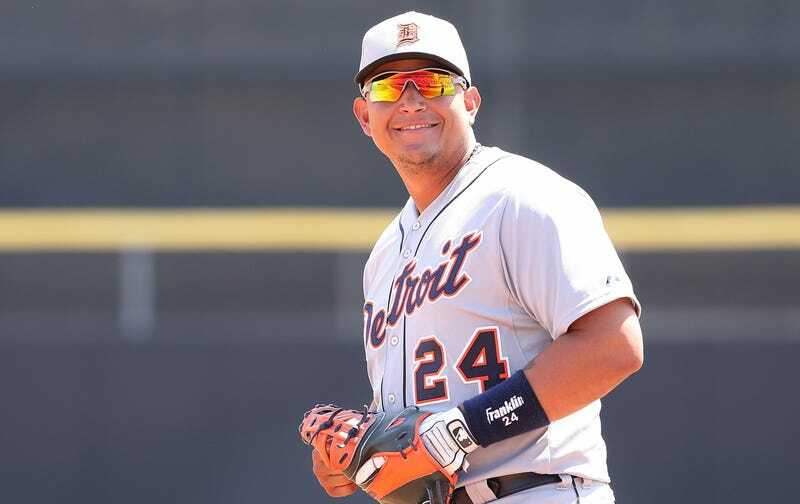 There is every likelihood the last few years of Cabrera's tenure will be expensive disasters. As Keith Law puts it, "The Tigers might as well just light much of the $292 million they're giving to Cabrera on fire." You can say that this inevitability is the price of locking him up as a Tiger for his career, and you can point out the $284.5 million Mike Ilitch is getting in taxpayer money, but I would not want to be the GM dealing with this contract in 2020. What makes it even more baffling is that there was no need to ink Cabrera now. He's got two more years before free agency, and, coming off consecutive MVP awards and two of the greatest seasons a hitter's ever had, his value and leverage may never be higher than they are right now. What the Tigers have done is to commit to paying a guy on his downslope for what he's doing in the prime of his prime. It reeks of a desperation move, coming off the heels of the collapse of contract talks with Max Scherzer, and getting out ahead of a potential Mike Trout contract bomb. Sometimes you have to overpay for talent. Miguel Cabrera's as talented as they come, but giving a 30-year-old anywhere near $300 million isn't just propping a team's window open—it's throwing a rock through it.